biographical essays on contemporary and historical playwork authors. For further details on submission or to submit an abstract, please email [email protected]. 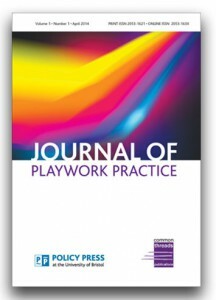 More information about Journal of Playwork Practice can be found here www.policypress.co.uk/journals_jpp.asp or follow JPP on Twitter @JPP_Journal . Previous Post​​New titles from Policy Press on ​Children, ​Young ​People and​ FamiliesNext PostWinning Title for the ACYIG Newsletter!